The reigning Miss Universe, Leila Lopes; Miss USA, Alyssa Campanella; and Miss Teen USA, Danielle Doty; visited with U.S. Army Garrison Stuttgart community members March 12 as part of a United Service Organizations European tour. Every year the Miss Universe Organization and the USO bring the crown holders overseas to share their experiences and goodwill with service members and their families. In Stuttgart, this year’s focus was on children and students. 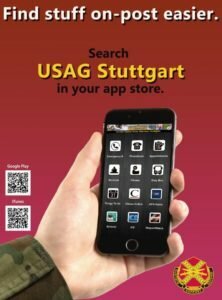 “It is a great opportunity having these young women here to talk and interact with students,” said Martha Povich, event coordinator for USAG Stuttgart’s Family and MWR. The pageant winners started their tour by having lunch at the dining facility on Patch Barracks, followed by a visit to Patch High School, where they were interviewed by students for American Forces Network Heidelberg and Patch Video Productions. While at the school, the trio also visited art and history classes, spoke to students about the importance of being themselves, and encouraged them to never give up on their goals and dreams. They also answered questions about their personal hobbies, their day-to-day activities and what they enjoy most about representing their titles. Courtney Perez, an eighth-grader from Böblingen Middle School, enjoyed the question and answer session with the pageant winners at the Panzer Youth Center. “It was easy to talk to them … they were nice and down to earth,” Perez said. For some children, meeting the pageant winners was overwhelming. Aysha Ready, a PHS ninth-grader, timidly explained her choice in watercolors for a painting to Campanella, Miss USA, after Campanella asked her about it. Other stops included visits at the CYS Services facilities on Patch Barracks and the Panzer Housing Area, and the Panzer Exchange for a meet and greet session with community members. Camille Walker and her three daughters stood in line for almost an hour to get a personalized autograph and photo with the pageant winners. “For the children, meeting these confident young women was the highlight of their day. It was inspiring for my girls,” Walker said. For the pageant winners, the visit gave them a chance to share their passions and outreach efforts that they contribute to during their reigns. For example, 21-year-old Campanella cooks and helps package food for a nonprofit organization.